Unable to contain the tremulous triumph in his voice, Phil stood at the bottom of the stairs post-teatime. For some reason my son, whose bedtime it was not, was tightly curled up in his duvet, oblivious to the stunning sea view just inches away from him. That’s an expensive view, I mentally admonished him. Eight hundred quid for seven days. More than one hundred pounds a day, which means…..what…five pounds an hour…..get out from under that duvet, son, and glue yourself to the window. I didn’t say a word out loud. “Its all right Felix. Everything’s going to be all right….” Phil was building up to his point with rhetorical crescendo. I blinked. Was I on a movie set? I was unimpressed by the revelation. The duvet was clearly moving, and Felix was very much alive. But my son was a great deal more taken by the announcement than me. The duvet parted and he emerged, with one of his Tennysonian, Princess Di smiles. Sort of Victorian fluttering eyelashes. Little boys do bashful triumph very well. So, it seemed Felix was not dead. He had been hiding under the duvet in a fit of pique, certain he had lost a game. Apparently, Phil had found some shield or other which said he had been reprieved. He was alive. He could just have asked his mother, I muttered under my breath. I would have put them straight without the aid of any shields. But for them, mammoth-slayer and trainee mammoth-slayer, the shield says it so much better. Phil has been looking forward to this moment for seven years, since his son was born. And our cottage retreat has made its inception possible. A small games box was packed in the car, the day of our departure. Its inscription: Tunnels and Trolls. Felix is being initiated into the art of the thinking bloke’s playtime treat: role play games. Phil spent happy teenage hours, days, months, with his Tunnels And Trolls game. Apparently that’s what 13 year old boys lived to do: gather round the ten-sided dice and take on a whole new identity. I asked Phil to explain a little about the game prior to my morning cup of tea. Twenty minutes later I excused myself politely to go to the toilet. It was complicated stuff. Let’s assume, for the purposes of this exercise, that I get some of this wrong. Felix, it appears, is an elven wizard. He has high intelligence. Of course, I say. He’s my son. No, Phil retorts, a little tetchily. At the beginning of the whole game, Felix rolls three, six-sided dice and adds their totals to get a number. This happens for each of a set of attributes: it determines how courageous he is, how clever, how strong, and so on. Then he starts accumulating gold points. Stay with me here. They determine things like what weapon he has, how great his armour is, etcetera, etcetera. The catch? My son has high intelligence, great fortune, but weak constitution. Lucky he had the shield, then. I’m not having some monster in a cavern, worth eight rolls of the dice plus 50, vanquishing my little boy, thank you very much. It’s all about numbers, multiples, variables, probability. Boys love that stuff. But you don’t need numbers to indulge in intricate role play, as any little girl will tell you. Mad is balanced on a knife-edge. Her play still centres around Barbie, but she models grown-ups constantly. She carries her handbag everywhere. But inside is a small cuddly owl called Lulu. Lulu popped up in a Christmas stocking, just after Maddie had her heart stolen by owls at a birds of prey demonstration. The littlest owl in the display was called Lulu. It sat on her arm, on one of those oversized falconry gloves, and eyes met. For Maddie, it was love at first sight. Lulu the stuffed toy goes everywhere with Maddie. And as my daughter is every bit as absent minded as I am, this can prove problematic. Facebook friends will remember the dramatic news that Lulu had been left, and subsequently disappeared, at our local sports centre during Felix’s swimming lesson. For three days our family was extremely tense. I will not divulge how we arranged Lulu’s return. These things can so easily backfire on one. Suffice to say, she’s with us at the seaside, and hooting happily at every development each fresh new day brings. Maddie has developed an entire language for Lulu. Not owl – like at all: clicks and monosyllables in the style of a small child. When Phil started talking Lulu’s dialect I chose to maintain a diplomatic silence. After all, it’s one of the greatest compliments you can give a child to play alongside them, using their rules. I’m reminded of kittens and cats as they play. The feather, the catnip stuffed toy- they’re not birds.They’re not mice. But the cat loves the theatre of the whole thing. Ears up, they subscribe heart and feline soul to a made-up reality. Reality, schmeality. It’s playtime. I’m frightened. 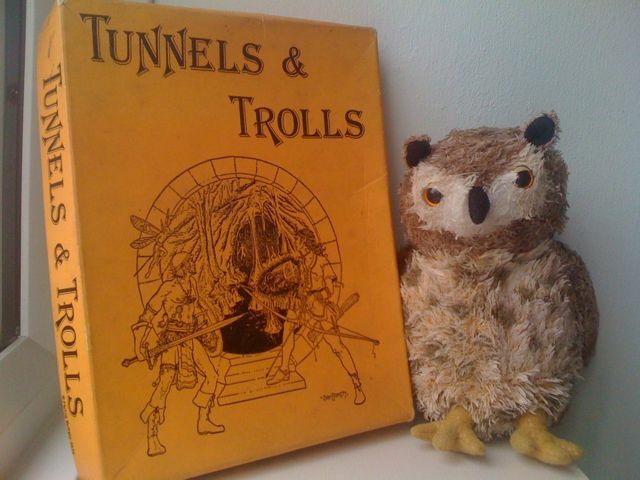 I don’t understand Tunnels and Trolls either. But what I’m frightened of, is that someone will try to explain to me how the game works! Not a pretty prospect! Phil is a grown man and can usually recognize the signs of acute distress when he begins to explain the rules. Felix, though-he’s a different matter. For a while at least, you will need an airtight diversionary tactic. Good luck with that one. My daughter lost her beloved Cromwell once, but only for a night. Cromwell! What am amazing name! And this from the lady who brought us the six word memoir! I bet conversation around your table is never dull:-) Glad you enjoyed the post.